OBJECTIVE As the experience with advanced laparoscopy is increasing, its application in the management of carcinoma stomach is on the rise. In this study we tried to analyze the safety, oncological adequacy and survival data of the patients who underwent Laparoscopic Radical Gastrectomy.PATIENTS AND METHODS. Case records of 348 patients who underwent laparoscopic Radical Gastrectomy with curative intent between 1998- 2010 were retrieved and analyzed. The mean age of the patients was 56.5 years, of which were 218 males and 130 females. The patients were evaluated by routine preoperative investigations and all operable tumours were included in this study. The parameters studied intraop events, histopathology, post op recovery, complications and survival.RESULTS.Of 348 patients, 134 (39.6%) had laparoscopic total gastrectomy with jejunal pouch reconstruction and 214 (61.4%) patients underwent subtotal gastrectomy and Roux en Y reconstruction. Twenty four patients (6.8%) had additional organ resections (splenectomy in 14 pts, splenectomy with distal pancreatectomy in 8 patients and transverse colectomy in 2 patients). Every patient had D2 and station 12 lymph node dissection. Mean operative time was 212.4 min and the mean operative blood loss was 134.6 ml (range 50 ml to 700ml). The postoperative morbidity was 27.8% and 2 (0.57%)mortalities. The mean hospital stay was 7.3 days. Thirty four patients (9.6%) had Stage I, 64 (18.4%) Stage II and 250 (72%) had Stage III disease. The mean proximal and distal margins were 6.5 cm and 4.5 cm respectively. Average nodes retrieved were 21 nodes. Five year survival in Stage I was 86%, Stage II 62% and Stage III was 42%. CONCLUSION.Laparoscopic approach is a safe and oncologically adequate procedure for the management of gastric carcinoma. 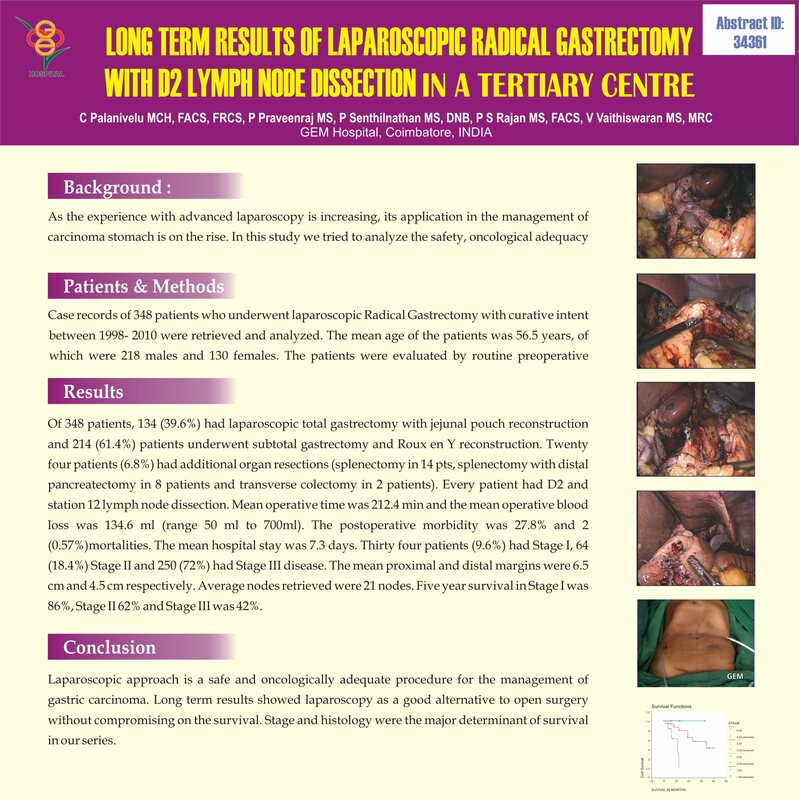 Long term results showed laparoscopy as a good alternative to open surgery without compromising on the survival. Stage and histology were the major determinant of survival in our series.